It's a Crafty Creations Challenges 100th challenge BLOG HOP and CHALLENGE celebration!! We've been planning this celebration for a while; we wanted a special way to say THANK YOU to our weekly players! We've had many fabulous sponsors along the way, and we know we couldn't have done it without them too. We invited them to join in our celebration and they have generously offered amazing prizes for our blog hop and challenge winners!! If you pop over to the Crafty Creation Blog you will find a list of all the fantastic prizes. 1.Please stop by the DT blogs and leave each CCC design team member a friendly comment! 2.The hop ends at the Crafty Creations blog, so leave us a comment there when you finish, so we know you've finished the hop! and the colours below - thanks Deena! that polkadoodles produced this year over at the Crafty Creations blog. subject and I'll doodle away! for my Crafty Blog hop creation. Love the moose. Super cute. Wishing you a very Happy New Year and thank you for all your support in 2010. Great card and yummy prizes! Hi Claire, hope you and those gorgeous children of yours had a fabulous Christmas. Very original to send him fishing, I love it. Great card. Thanks for the chance of winning the digi, I love it. I absolutely love the card...that moose image is just TOO CUTE!! Thanks for the great prize and chance to win. What a great guy card! Fab card, love Meljen's images. Great layout too. This fishing dude is one of my FAVORITES as it reminds me of when my dad used to take us kids down to the pond to fish. LOVE IT! But your polkadoodles image ...OH MY GOODNESS - that is the MOST adorable thing I've seen. LOVE the whimsy. Going to go and check out your polka doodles shop. LOVE your creativity! What a cute masculine card! Hi Claire, this is so cute! Love how you pulled the colors together. The image is really darling. Great creativity!! Thanks for the fun hop!! Super cute image and a wonderful card! Off to hop! the moose is so cute!! great card! WOW love that moose, I have purchased that image but have not had a chance to color it yet, thanks for the inspiration. Aewsome Card. 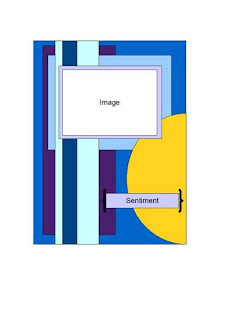 I love the image. Wow, thats an awesome card. I love the colour scheme and the image is fab. Aaww, the moose is cute. My dh would love that it's fishing,lol. Cute card! I love the image. My first visit to your blog - thanks to this hop. Love your card. Your looking for ideas for a digi drawing, I'm in need of a digi stamp of a beaver - thanks for the chance to win. omg I love that stamp! and great job with the coloring! What a sweet card. Love the moose, he's so funny. I'd love to see something from under the sea, like a funny turtle or something like that. interesting combo, but its seems to work... love the moose..definitely for a guy..good job. Great coloring on the moose guy! 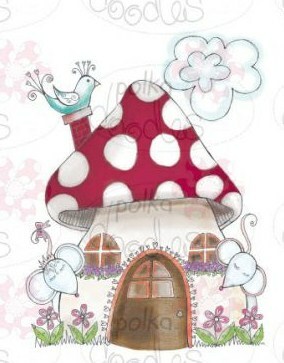 And the little mushroom house is adorable! We just moved, and that would be perfect for an announcement card!